Within the RBG Arboratum, at the fringe of the Dogwood and Redbud Collection, beside the Lilac Dell on a relatively steep slope, beautifully shaded from the sun by the embracing canopy of a fully flowering Dogwood tree, I built my earth art. An ideal site for growing fungi – nature’s greatest recycler. Directly on the earth, a new dimension to my kinetic ‘living’ sculpture series was to evolve. All my previous kinetic works incorporated stone with recycled wood – this one was to use only reeds, sticks and string – to be returned to earth over time by fungi. Consequently, in comparison to my other kinetic works, it will be a fast mover. The full sequence of its artistic evolution will perhaps be only seven years instead of twenty or thirty. 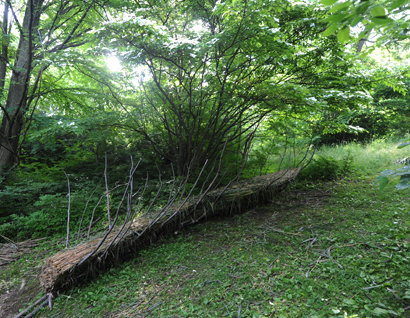 Sympodial growth (putting it simply, this is a zig zag pattern of growth) of the nearby (and somewhat threatened) Sassafras tree inspired the structure and life/evolution of the piece. During the last severe winter the weight of snow on trees, exacerbated by a hoarfrost, caused many pine branches to collapse in the Arboratum. These proved perfect to be recycled for the curved sticks. And the invasive Common Reed Grass, Phragmites australis, was harvested from a wetland and delivered daily to my site by RBG staff. Untreated Manila string and Sisal cord was used for the binding. New Zealand’s Chris Booth whose magnificent stone sculpture assemblages and stone blankets develop an inter-cultural dialogue, for the Royal Botanical Gardens has created a ten metre by three metre long kinetic sympodial growth earth art piece. Recycled curving branches are woven together to form an off the ground structure that undulates its way up along the hill. It could be a container or a vessel, a nature container, itself part of nature. Using local reeds within the structure, Booth proposes an outdoor site-specific installation where fungi spores actively transform the sculpture, changing it rather. Slowly, the network of mycorrhizae and mycelia and fungal spores throw up fruiting bodies, invade the reed mass, and the sculptures devolves, returning to the earth. As the installation begins to fall onto the ground, a feather-like pattern that celebrates sympodial growth and the work of fungus – the greatest recycler on the planet remains. Less about art with a capital A and more cutting edge cross-disciplinary intervention, Chris Booth’s an artist/innovator and visionary in his own right. Curator and writer: John Grande.